ELVIS PRESLEY - FROM NASHVILLE TO MEMPHIS - THE ESSENTIAL 60'S MASTERS - ORIGINAL 1993 LIMITED EDITION WITH A LOT OF PREVIOUSLY UNRELEASED TRACKS - 130 TRACKS = A Six LP Set - OUT OF PRINT FOR TWO DECADES. Includes 19 previously unreleased/alternate performances. 48 page, full colour booklet with many rare phortogrpahs from the Graceland photo archives. Contains full supporting recording session data and complete 60's discography. Liner Note Text by Peter Guralnick. Includes a sheet of RCA records label full colour stamps depicting Elvis Presley's 60s record covers. The ultimate digitally remastered collection from the original RCA Record Label Master Tapes featuring Elvis Presley's finest 60's peerformances from Nashville and the complete 1969 Memphis Sessions - Special Bonus Track. The legendary and previously unreleased "Love Me Tender/Witchcraft" duet with Frank Sinatra. THE HIGHLY ANTICIPATED FOLLOW UP TO THE 3 TIME GRAMMY NOMIINATED BOXED SET, "THE KING OF ROCK'N' ROLL, THE COMPLETE 50'S MASTERS". You should never pass up the opportunity to upgrade your collection. They're each very limited in their pressings and disappear with extraordinary quickness from the vinyl market. This causes prices to skyrocket because once they are gone, they are gone forever! Don't second-guess yourself with this chance to upgrade your collection because before you know it, the opportunity will have passed forever. THIS SHOWS 5 DISCS BUT THEY ARE ON SIX DISCS. It's Now or Never. Girl of My Best Friend. Girl Next Door Went A'walking. I Will Be Home Again. I Want You With Me. Put the Blame on Me. That's Someone You Never Forget. (Marie's the Name) His Latest Flame. For the Millionth and the Last Time. Anything That's Part of You. Gonna Get Back Home Somehow. Just for Old Time Sake. I Feel That I've Known You Forever. Just Tell Her Jim Said Hello. Please Don't Drag That String Around. (You're The) Devil in Disguise. What Now, What Next, Where To? (It's A) Long, Lonely Highway. Tomorrow Is a Long Time. Beyond the Reef [Original Undubbed Master][#]. Come What May [Alternate Take][#]. I'll Remember You [Original Unedited Master][#]. If Every Day Was Like Christmas. Guitar Man/What'd I Say [Original Unedited Master][#]. Hi-Heel Sneakers [Original Unedited Master][#]. You Don't Know Me. Wearin' That Loved on Look. You'll Think of Me. From a Jack to a King. Without Love (There Is Nothing). I'll Hold You in My Heart (Till I Can Hold You in My Arms). True Love Travels on a Gravel Road. Stranger in My Own Home Town. And the Grass Won't Pay No Mind. It Keeps Right on A-Hurtin. If I'm a Fool (For Loving You). This Time/I Can't Stop Loving You [Informal Recording][#]. In the Ghetto [Alternate Take 4][#]. Suspicious Minds [Alternate Take 6][#]. Kentucky Rain [Alternate Take 9]. Big Boss Man [Alternate Take 2][#]. Down in the Alley [Alternate Take 1][#]. Memphis Tennessee [Alternate Take 1 from the "1963 Session"][#]. I'm Yours [Alternate Take 1 Undubbed Version][#]. (Marie's the Name) His Latest Flame [Alternate Take 4][#]. That's Someone You Never Forget [Alternate Take 1][#]. Surrender [Alternate Take 1][#]. It's Now or Never [Original Undubbed Master][#]. To view our current items up on E-Bay. Mymusicfix has been told we have the best collection of Rare, Out of Print music collectibles on E-Bay. It's illegal to falsify. FACTORY SEALED OUT OF PRINT PRODUCT is IRREPLACEABLE and therefore NOT RETURNABLE. Because of Postal Regulations in following countries -- U. (England, Ireland, Wales and Scotland), SOUTH AMERICAN COUNTRIES, QATAR, PHILIPPINES, SRI LANKA, ISRAEL, RUSSIA, MEXICO and MALTA. International Buyers are responsible for their countrys. 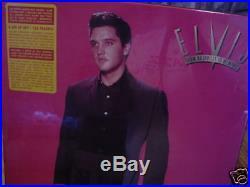 The item "ELVIS PRESLEY NASHVILLE TO MEMPHIS RARE 1993 RCA/BMG RELEASE Sealed 6 LP BOX SET" is in sale since Tuesday, March 24, 2009. This item is in the category "Music\Records". The seller is "mymusicfix2" and is located in Lake Forest, California.